The Port of Thunder Bay was what began Port Arthur and Fort William, the founding communities of Thunder Bay. Commercial activity has been and continues to be the mainstay of the Port and a significant sector in the economy of Thunder Bay. Government activity regulates the various users of the Port. The Royal Canadian Navy is represented by the Naval Reserve Division HMCS GRIFFON. Recreational users derive a lot of benefit from the Port. What follows is a description of the Port and various maritime groups that are part of the Thunder Bay maritime community. The Port of Thunder Bay is 8th on the total tonnage list of annual shipments for all Canadian Port Authorities. The Port counted 7 operating grain elevators and a malt house which directly employed more than 400 operating and management personnel supported by a further 105 persons engaged in inspection, sampling and weighing. The 2nd and 3rd largest commodity movements through the port are coal and potash. Other cargoes are salt, steel, aggregates, petroleum and liquid chemical products, and general cargo. It operates Keefer Intermodal, which includes a warehouse facility and railway marshalling yards, and administers Harbour Park subdivision. Keefer Terminal sees about 17 ships a year bringing in structural steel, wind mills and wood pellets. It is a transportation hub for the west. Under the provisions of the Canada Marine Act, the Thunder Bay Port Authority is responsible for the operation of the Port including ice breaking, maintenance of aids to navigation and the breakwater, and dredging. HMCS GRIFFON is a Naval Reserve Division (unit) in the Royal Canadian Navy. GRIFFON’s purpose is to recruit and train people to augment the Navy, serving aboard Maritime Coastal Defense Vessels (MCVD) and Frigates. Sailors train one night a week and go away for summer training and work. Once people are qualified they can obtain short-term contracts for employment. GRIFFON is located at 125 Algoma St. N. Contact GRIFFON at (807) 343-5200. GRIFFON's Boat Shed and the Lake Superior Sail Centre Boat shed are located on the waterfront north of the marina. Shown in the picture is a RHIB. 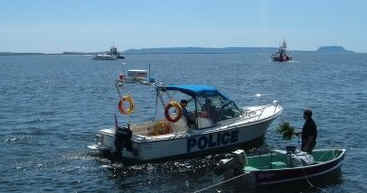 The Rigid Hulled Inflatable Boat is used for small boat operations and as a workboat on larger vessels. It's two pontoons provide unsurpassed stability and the rigid hull allows for maximum speed. It is 24 feet in length and weighs over 2 tonnes. It can carry 18 persons plus a crew of 2. It's top speed is around 45 knots and is an extremely stable and maneuverable boat. It is powered by a 6 cylinder turbo charged diesel engine with a range of approximately 100 nautical miles. The Naval Officers’ Association of Canada (NOAC) has existed in various forms since 1919, providing a rallying point for continued social interaction of Naval veterans and as a means of providing coordinated advice to the Navy of the day. In light of the many changes that have taken place with regards the Navy over the years, the organization has continued to change as well, and membership is now extended to all ranks and to those who may not have seen Naval service but have a strong interest in the Royal Canadian Navy. The three pillars which form the mission of the NOAC are; public education, maritime heritage and camaraderie. Public education involves helping educate the Canadian public on their Navy and what it needs to continue to contribute to Canada’s security at home and around the world. Maritime heritage involves working with the fifty-plus maritime museums across the country to bring Canada’s remarkable maritime history to light, while also contributing to its preservation. Camaraderie involves ensuring that all members enjoy the comradeship derived from a shared interest in service to Canada and an affinity for the sea, as well as supporting less fortunate members and their families. The Thunder Bay Branch meets regularly to discuss issues related to the three pillars of the mission and to provide venues for social interaction. For further information please contact the NOAC Thunder Bay Branch President Anne Zuliani, Capt(N) (ret’d) at anne1.zuliani@gmail.com. Located at the north end of the Marina, the Anchorage was dedicated June 1, 1997 as a place to meditate and enjoy. The ANCHORAGE is a memorial to the navy and merchant navy ships and sailors who perished in the Second World War; see The Commemoration of the Battle of the Atlantic. It is dedicated to the men and women of the Royal Canadian Navy (RCN), Royal Canadian Navy Reserve (RCN(R)), Royal Canadian Navy Volunteer Reserve (RCNVR), Women's Royal Canadian Naval Service (WRCNS), and the Merchant Navy (MN), who volunteered and served with honour and distinction for freedom and country. Erected jointly by the NOAC Thunder Bay Branch, the Thunder Bay Naval Association, RCNA, and with the help of many friends who care and remember. The Base at Keefer Intermodal houses the maintenance center and the CCGS CAPE CHALLION crew quarters. The lifeboat, CCGS CAPE CHALLION built in 2003, has a crew of four, twin diesels and a speed of 26 knots. • Promote dedication and pride of membership. 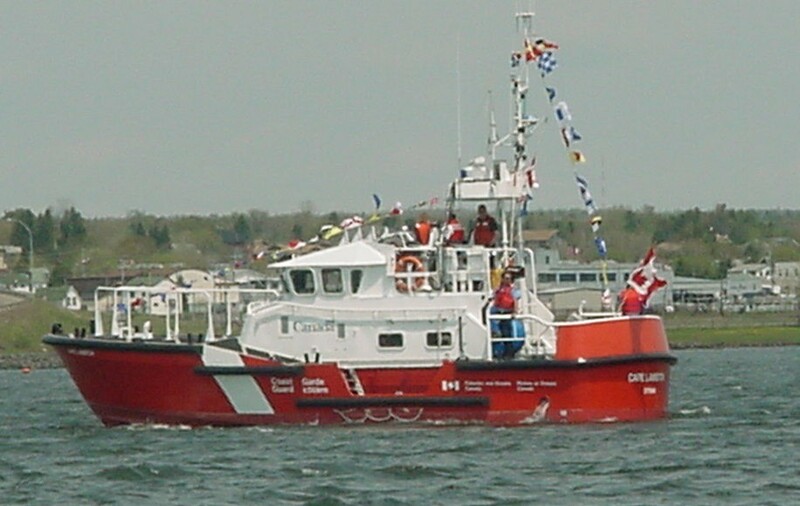 The Canadian Coast Guard Auxiliary Central & Arctic Region, CCGA (C&A), was incorporated in September 1978 under the sponsorship of the Federal Government, for the purpose of providing organized voluntary maritime search and rescue (SAR), and the promotion of safety afloat; in an Auxiliary support role to the Canadian Coast Guard. 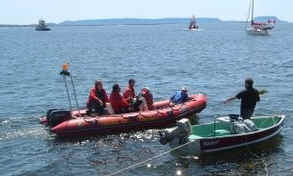 The CCGA (C&A) supports the Canadian Coast Guard with 926 volunteer members using 102 vessels. The volunteers of Central & Arctic provide approx 123,671 hours of service per year. The organizational structure of Central & Arctic is testament to its grassroots strengths and diversity by providing SAR response, boating safety and prevention messages to the largest geographic area within the CCGA. The Coast Guard Auxiliary is comprised of members who use their privately owned vessels in a volunteer capacity. The Auxiliary supplements the full-time Coast Guard, which is particularly important in areas where a Coast Guard Life Boat such as the CAPE CHALLION is not stationed. The function of navigable waterways law enforcement must be distinguished from that of search and rescue, and enforcement includes the enforcement of laws regulating the operation of and required equipment on vessels. • river or canal system within or bordering on the Province and specifically designated as under federal jurisdiction, e.g. the Ottawa River–Trent-Severn waterways system. • Canada Shipping Act and Regulations. The Thunder Bay Fire & Rescue Service provides citizens with a highly trained emergency service capable of handling various emergency situations including ice and water rescue. Lakehead Tugboats is locally owned and operated by Paul Lecuyer. It operates the tugs: George N. Carleton, Robert John, and Teclutsa. Family owned and operated for over 50 years by the Dawson family. The company began as Thunder Bay Marine Services Limited in 1959, by Elliott and Wealthy Dawson. They operated a “bum boat”, or floating store, selling dry goods to vessels at anchor. Son, Gerry purchased it in 1983. Thunder Bay Tug Services was established in 1989 with a leased tug, but then purchased the tug Point Valour in 1993, which towed the James Whalen from Quebec to Thunder Bay. The tug Glenada from Sarnia, was added in 1995 to help with the increase in “ship assist” work in Thunder Bay. The tug Miseford was purchased in Port Maitland and sailed here in September 2004. Robert W. and Rosalee D. are also vessels of Thunder Bay Tug Services. Thunder Bay Tug Services Ltd. is locally owned and operated by Captain Gerry Dawson. It’s primary business is “ship assist” work in the Thunder Bay Harbour, and the Glenada has also towed barges to Isle Royale. The Tug Glenada and crew rescued two men from the propellorless Grampa Woo, off Thunder Cape in 15 foot waves in October 1996. Captain Gerry Dawson, engineer John Olson and deckhand Jim Harding were awarded Medals of Bravery by the Governor General in Ottawa in 1997 for this rescue. Commercial fishing was one of the first activities in the port. It was strong prior to the coming of the sea lamprey with the opening of the St. Lawrence Seaway in 1960. Ten commercial fishing vessels fish Whitefish, Lake Trout and Herring from Thunder Bay to Hurkett. The fish are sold to Presteve Fisheries of Sault Ste. Marie and Kemp Fisheries of Duluth, which export the fish around the world. In Thunder Bay the commercial fishing vessels dock at the mouth of Current River. Some of these vessels are also in the Coast Guard Auxiliary. Situated in beautiful Marina Park on the shores of Lake Superior, the Marina can be accessed off Water Street in the north core of the City. The Marina is open May 15 through October 15 annually and offers 271 slips for City residents and visitors. Also available are water moorings and dry land storage facilities. Services include washrooms, laundry and shower facilities, pumpouts and fuel (gasoline and diesel). Attendants are on duty 9 am to 9 pm all season. On-site security is available from 9 pm to 9 am. Boat launch ramps are available for use by the public on a user fee basis. Off season please contact Parks Division at (807) 625-2313. Sail Superior is a locally operated business providing sailing and zodiac tours on Lake Superior. Sail Superior's fleet consists of two 40ft sailboats and one 30ft Zodiac. Passengers can choose from a variety of tour options including a wine and cheese sail, Sail and Hike the Giant, Zodiac Harbour tour, and many more. Sail Superior aims to provide a comfortable and enjoyable experience for all who wish to explore Lake Superior. All our tour options are available for booking at sailsuperior.com or for custom tours call (807) 623-3333. The Pool 6 Cruise Ship Facility opened in July 2009 and it is operated by the City of Thunder Bay. It is located south of the Prince Arthur's Landing Marina and is the site of the former Saskatchewan Pool 6 elevator. Clelia II is pictured here in July 2009. Two years ago the rallying cry heard loud and clear in Thunder Bay was “Bring Back the Alexander Henry”. That’s when the former Canadian Coast Guard ice-breaker and buoy tender– which had been built in Thunder Bay in 1958 but had been a museum ship in Kingston since 1985 -- faced either being sunk or scrapped when the museum’s property has been sold. That’s when the Lakehead Transportation Museum Society (LTMS) took on the major project of saving the Henry and bringing her back home to Thunder Bay. Launched on July 18, 2018 at the former Port Arthur Shipbuilding Co. Ltd in Thunder Bay, she entered service in 1958 for the Canadian Government’s Department of Transport Marine Service and transferred in 1962 to the newly-formed Canadian Coast Guard. After 26 years of service, she was de-commissioned in 1984 and a year later became a museum ship in Kingston. When the museum’s leased property as sold in 2016, the museum had to move out and Henry’s fate became uncertain. After LTMS reached a deal with Kingston and funds were raised for towing costs, the Alexander Henry arrived back home a year ago in June after a 1,000-mile journey through the Great Lakes. Then after almost five months of further negotiations, Henry was towed on November 23, 2017 to her permanent waterfront site at Pier 6 at Marina Park. Restoration work, cleaning and painting has been ongoing by board and volunteers since spring to get the Henry ready to open for the public in June. Saving the Henry was phase one of LTMS’s goal of establishing a transportation museum in Thunder Bay. A special rededication and re-christening ceremony for the Alexander Henry will be held on July 18 on the 60th anniversary of her launch at the shipyards in 1958. The Park celebrates the heritage of the river that Fort William was built up on. Fort William was originally located in what is now called the East End and a memorial cairn on McNaughton St. marks the location. Small lake vessels berthed along the river near Simpson St. The warehouses on Simpson Street bear witness to the past shipping activity of the region. The opening of Keefer Terminal in 1960 meant the closing of these wharfs beside Simpson St.. The James Whalen was built in 1905 as an ice breaking tug and worked in Thunder Bay Harbour until its retirement. She is now berthed permanently at the Kaministiqua River Park. The Sailors' Memorial Park at the Kaministiqua River Park helps us to remember local merchant sailors lost in the Battle of the Atlantic in World War 2. The memorial was originally located on the N. M. Paterson & Sons property off James St. by the Kaministiqua River swing bridge. Kenordoc Shelled by German submarine, U-48, and sunk 15 September 1940; seven men were lost. Portadoc Torpedoed by U-124, 7 April 1941; one man lost. Collinddoc Sunk by a mine, 13 July 1941. Mondoc Hit submerged object, sank 5 Oct 1941. Sarniadoc Torpedoed by U-161 15 March 1942; all hands were lost. Torondoc Torpedoed by U-69, 20 May 1942; all hands were lost. Troisdoc Torpedoed by U-558, 21 May 1942; entire crew survived. Prescodoc Torpedoed by U-160 29 July 1942; there were 5 survivors. Hamildoc Foundered in heavy seas, 1 January 1943; all survived. Soreldoc Torpedoed by U-1302, 28 February 1945; 15 lives were lost and there were 21 survivors. The Rowing Club is located on the Kaministiqua River south west of the park. voluntary organization, it offers offering courses for recreational boaters. Classes start in January at Superior CVI or courses may be taken on a self study basis any time. To register, go to www.boatingcourses.ca. Boating Basics is done on-line and it grants the Pleasure Craft Operators Card (PCOC). It is required for anyone operating a recreational vessel. * offered in the winter of 2019 . Each year the Thunder Bay Yacht Club offers four days of instruction in basic sailing and an introduction to sailboat racing. The New Crew Program takes place in early June. It consists of three hours of in-class instruction followed by on the water sailing experience on keel boats owned by members of the Thunder Bay Yacht Club. The philosophy of the program is based on the conviction that the best way to learn to sail is to crew on a racing sailboat even if your long term objectives in sailing do not include racing. If you join a crew, you will gain considerable experience learning from experienced skippers and fellow crew members. The objective of the course is to make participants comfortable and contributing members of a racing crew. Anyone interested in learning to sail is invited to contact Bill Dunlop at 768-5885. The Lake Superior Sail Centre runs sail training programs for local Sea Cadet Corps: RCSCC Vindictive (Thunder Bay North); RCSCC Fort William (Thunder Bay South); and RCSCC Onondaga (Nipigon). The Sail Centre is co-located with HMCS GRIFFON's boatshed on the Thunder Bay Harbour, just north of Marina Park. The Royal Canadian Sea Cadet programme is for young men and women ages 12 to 18. The Canadian Armed Forces in partnership with the Navy League of Canada run the programme. Temple Reef sailing Club is a not for profit volunteer run boating club located in Thunder Bay Ontario Canada. Our primary focus is to promote one-design sailboat racing. Sail Thunder Bay offers learn to sail programs for children and adults at the beginner, intermediate and advanced levels. NEW CANSail Programs and Race Coaching are taught by our knowledgeable and well trained certified Sail Canada Instructors. Sail Thunder Bay is a non-profit sailing school operated by a group of devoted sailors and volunteers from the Temple Reef Sailing Club. We are located at the end of Pier One in Thunder Bay Marina Park and are open from June to September for all local sail instruction. Fort William Historical Park is a provincially-funded historic site operated by the Ontario Ministry of Tourism. Through its living history program, the Fort depicts the fur trade activities of the North West Company at Fort William Historical Park, inland headquarters and site of the Company's annual Rendezvous from 1803 - 1821. It has been rebuilt on its present location, further upstream from its original location. Shown here is the monument on McNaughton St., in Fort William's East End commemorating the original site for Fort William. Beyond the railway cars is the Kaministiqua River. The Neebing Voyageur Brigade is an historic re-enactment group dedicated to the preservation of fur trade history. Over the last 30 years, hundreds of young people have learned and gained an appreciation for our voyageur heritage and life styles through their participation with the Neebing Brigade.